A small utility that allows you to calculate the cryptographic hash value of a string or file... Multiple hashing algorithms are supported including CRC32, MD5, SHA1, SHA256, SHA512 and many other algorithms. 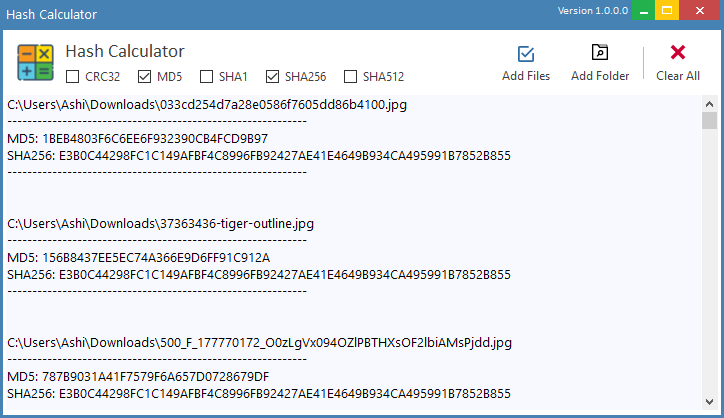 This simple application helps you quickly and easily list the hashes of your files. A free utility tool to calculate the multiple hashs of multiple files. How to list file hashs ? The first step is to download the "Hash Calculator" and install. Then open the App. You will need to identify the folder you want to be scanned for the files. You could also drag & drop your target folders.